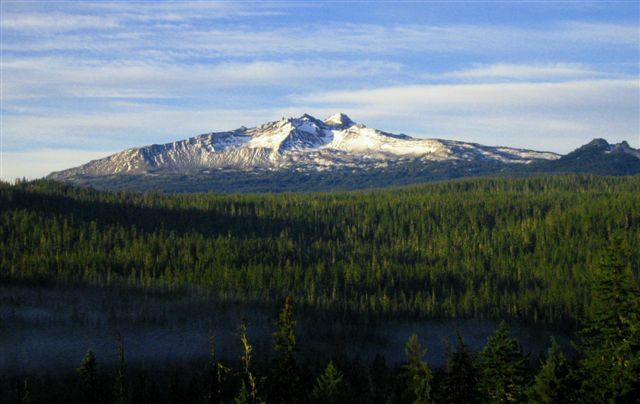 My partner and I were deer hunting near the Diamond Peak Wilderness area south of Hwy 58 near the Cascade Summit in Oregon. It was the second weekend of the season, 1988. We had a small travel trailer to stay in. We arrived at our camp spot almost at midnight on Friday. It was about 2:00 am when we finally got settled down and hit the sack. My partner was asleep almost immediately as I could here him snore lightly every once in a while. Even though I was dog dead tired, my head was going 100 miles per hour after the long day we had. AS I was lying there thinking about what I might have forgotten, I heard in the distance a thumping noise. It came from the south of us toward the wilderness area. At first I thought it might be some other hunters setting up camp but I heard no other noises. It was a strange sound, like dropping a heavy object onto hard ground. It finally faded out and I went to sleep. The next morning we drove down the road we had come in on and stopped by a small creek. My partner had done some scouting in this area some time before and said this should be a good place to hunt. With only about 3 hours of sleep I didn't care and said "ok". We split up with about 30 yards between us as we worked our way down the creek, losing sight of each other occasionally because of the brush. After about 2 hours I lost sight of him for quite sometime and began to call his name in a very low tone. I did not get an answer from him so I started looking around. After a short time I found him sound asleep against a tree stump with his rifle across his legs. As tired as we were, I couldn't really blame him and decided to wonder around on my own for a little while. I followed the creek on down for about another hour when the brush became so dense I could go no farther. I made a hard left turn and after about 30 yards came to a dirt bank about 10 feet high. It was pretty steep and as I approached it I saw some depressions going up it. I went up beside them but really didn't pay much attention until I got to the top. The last depression was not just a depression but also a footprint or about 1/2 a footprint from the toes to the ball of the foot. It was HUGE. About 7 and 1/2 inches across at the widest point. It was also clear enough to tell which foot. It was the right one. It also had 5 toes. I pondered for a moment and then looked for more prints but the brush was too thick. I wondered why only 1/2 a print and then it dawned on me when you go up a steep bank you don't walk on the whole foot, you use the toes and the ball of the foot as if you were taking steps. I did not have a camera with me at the time and the only other thing I remember is that it was about 2 and 1/2 times deeper than my prints and I weighted 200 lbs. Realizing how late it was getting I started back for my partner who was still asleep when I arrived. I woke him up and we headed back to our vehicle. I never told him because he is a non-believer and told me some years before that he did not believe in that "B.S." Nothing else happened the rest of our time there. I have never been back to that spot since but would like to go someday. A few years later I read in the local paper that some hunters in that same area reported hearing strange screams late in the day.